Spring is for Turtles... and how People Can Help them! I live on a large Calhoun County lake that contains six of Michigan’s ten turtle species, and my neighbors and I see a steady procession of nesting females every spring. These nests are important to the entire lake because we live in one of the few good nesting areas that turtles can reach through gaps in our nearly continuous seawalls. However, this concentration of nests attracts large numbers of raccoons, and these predators sniff out and eat the eggs of practically every unprotected turtle nest. This situation was hurting our turtle populations so badly that a few neighbors and I started protecting every nest that we knew about several years ago. This has worked so well that herpetologists and other knowledgeable individuals stop by regularly to examine nests and exchange turtle experiences with us. As a result, we know that the same basic problems are threatening turtle populations across the State, and that far too few people are helping them. Protecting turtle nests is an excellent way to introduce youngsters to nature, and we regularly involve children from about six years old on up. At our lake, we help musk, painted, Blandings, softshell, snapping and map turtles—and these species nest in quite similar ways. As a result, the information that I am providing on map turtles basically describes how to protect the nests of any of these species. Female map turtles do perform more pre-nest basking than most of these species, and our local ones typically begin basking in late May on logs that I maintain in about a foot of water. These logs provide the turtles with a convenient place to bask near their nesting area. They also allow us to observe them and estimate when they will begin nesting. These mature map turtles typically spend a couple of days basking before they crawl up on land and look for a suitable nesting location. Map turtles and most of our other native turtles are extremely picky nesters, and they frequently wander around testing the sun and soil at several locations before picking a nesting site. They frequently return to the lake without nesting, and then come back on land and spend more time searching on the following day. 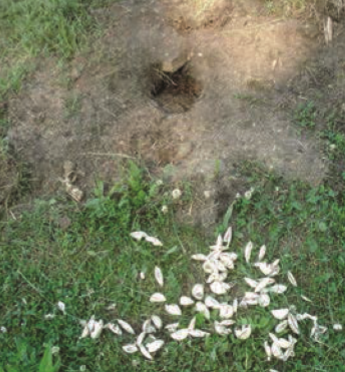 When one of these map turtles finds a satisfactory site, she uses her rear legs to dig a hole six or more inches deep and a side chamber large enough to hold ten to eighteen eggs. This configuration makes it important to look for turtle eggs several inches to the side of where one might normally expect to find them. 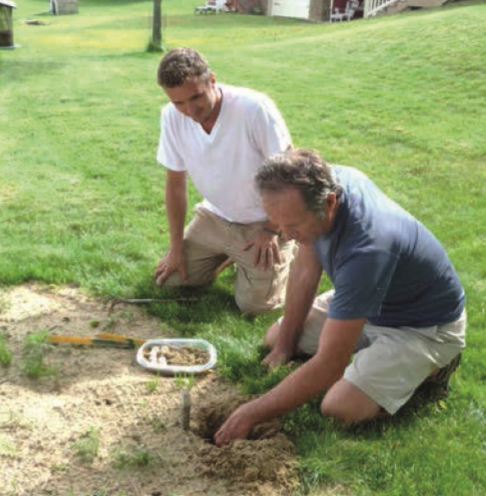 ​We begin watching for map turtle nesting activity in late May, and stay a considerable distance away from any turtle that we spot until it has completed its work and headed back to the lake. Then we fasten cage wire fencing with one by two inch holes or hardware screen with one-half inch holes down flat over the nest with plastic tent stakes. We prefer the cage wire, but raccoons are so nimble at reaching down through it that we normally use a double layer with slightly offset openings. Raccoons are also so adept at tunneling under anything between them and food that we use pieces of fencing or screen at least 16 inches square. Raccoons, skunks, and opossums can sniff out fresh new nests so well that we try to physically protect every nest on the day that it is laid. If we cannot do this, we conceal the nest’s odor by spraying something unpleasant like rabbit repellent on the ground above it. The hatchlings that emerge from these nests instinctively know which direction to go to reach water. However, we occasionally move a nest to a sandy area near the lake when its location or the trip to water would be too perilous. These relocations include the nests that turtles keep laying in a certain bonfire area. Nests are easy to relocate when they are no more than a couple of days old. In these cases, the eggs simply have to be clustered together in a natural way in the new nest. However, the process is harder for nests that are older than this because embryos have started developing in the eggs. This makes it necessary to orient each egg in the new nest exactly like it was in the original one. It is also critical to avoid jostling them during the move. Nevertheless, we have had good success moving developing eggs like this in trays of sand. We perform all of these tasks on a few adjacent properties, and do not collect or hold any turtles or eggs. I mention this because certain more complex projects could require a DNR scientific collector’s permit. The protective fences that we fasten down over nests eventually have to be elevated enough to allow the hatchlings to dig their way out of the ground and travel to water. Most of our local turtle species emerge in September, so we use small stones to elevate their fences a couple of inches in late August. ​Map turtle hatchlings are exceptions that nearly always over-winter in the nest and emerge during the following May at our location. However, we also raise these fences in late August on the slim chance that they will emerge early. When this does not happen, we place insulating leaves on top of the fence and nest to help these tough hatchlings overwinter in the ground. While these methods can probably be improved, they have worked well for us. We receive a variety of positive comments, but our most gratifying feedback occurs when we see tiny hatchlings survive the nesting process and slide into the lake. The fence was temporarily removed from this nest to examine its development. Destroyed turtle nest. Raccoons leave turtles nests looking like this. 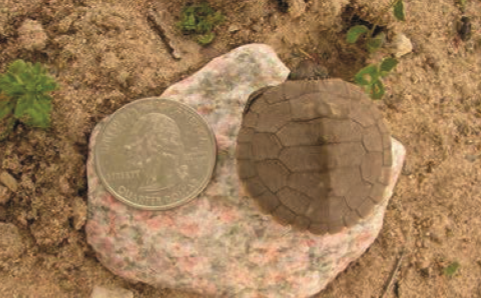 Map turtle hatchlings are larger than a quarter.